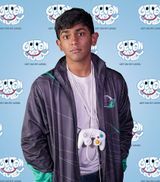 Lima is an SSB4 Bayonetta main from Dallas, Texas, and is considered to be one of the top Bayonetta players in the world. His breakout tournament was EVO 2017, where he placed 9th. A year later, he won EVO 2018, although the set he played against CaptainZack was controversial since many claimed that "he and Zack weren't trying". He has victories over top players such as Dabuz, Ally, Larry Lurr, KEN, Mr.R, VoiD, ANTi, CaptainZack, ESAM, and Kameme. Lima is currently ranked 1st on the Texas Smash 4 Power Rankings and 20th on the Panda Global Rankings 100. On December 6, 2017, Lima was signed by EarthRoot Gaming, which he left a few months later on May 25, 2018. Along with CaptainZack and tamim, Lima has a mixed reputation in the Smash community due in part to maining Bayonetta, but moreso because many players have perceived him to be socially inconsiderate. This has led to some disrespecting and harassing him, such as being booed when he plays and resulting in community drama. He is infamous for his lackadaisical grand finals set at EVO 2018 with CaptainZack. This page was last edited on March 23, 2019, at 13:12.